Manufactured in Japon from 1977 until after 1979. 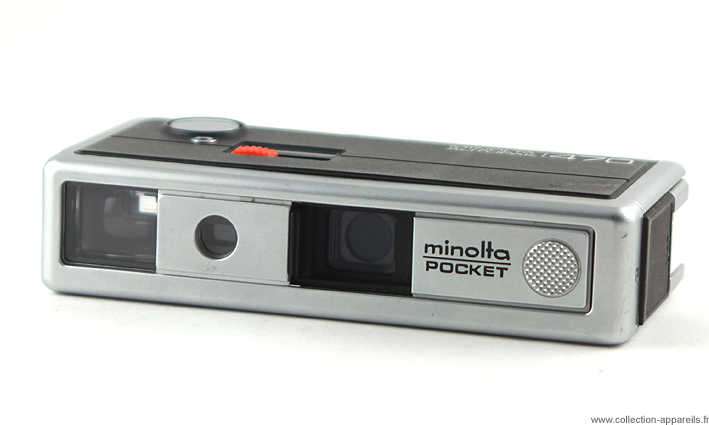 Concurrently to its traditional manufacture of 35 mm camera , Minolta manufactured under the name of “Autopak” a series of cameras to format 110 and 126. These cameras are of very good quality for the majority. The 110 which carries the name from “470” is the top-of-the-range one. It is built in materials of good quality, assembled very well. The front face can laterally move in order to protect the lens. A filter can slide in front of the lens to take portraits, with autocorrection of the parallax. The lens is Rokkor 26mm (f3.5) of Tessar type with 4 lenses made of glass, field angle 45°. Under the camera is a table to connect the pictograms of setting zones and the real distances. The distance setting is done by using the visible red button on the photograph. The choice is mentioned in the finder by a red needle which comes to position in front of a recall of the selected pictogram. A second red button, nonvisible on the photograph, because located on the side of the camera, makes it possible to check the batteries. The shutter speed is electronically controlled . It goes from 2 seconds to 1/1000. A cell controls the exposure. Camera presented in Phot' Argus n°80.